For enemies that also appear (or exclusively appear) in dungeons, their stats will be shown at the base level, because their exact stats at any given point are calculated from these base values. 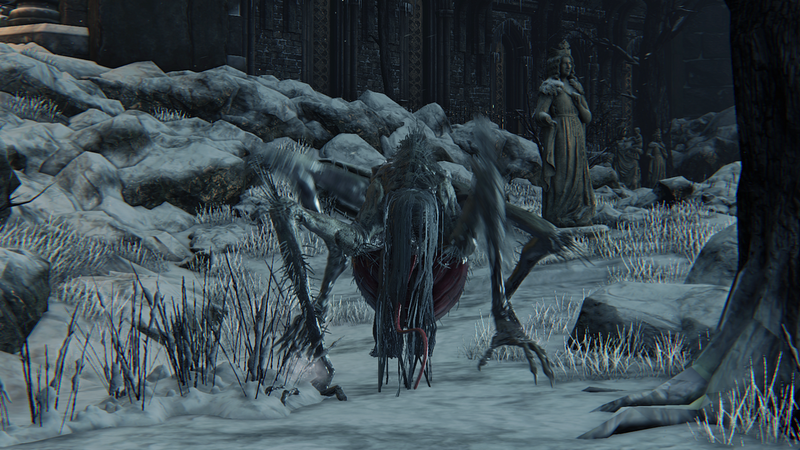 Large insect-like enemies encountered in Cainhurst's Castle Grounds and Chalice Dungeons. They move and attack very quickly and inflict heavy damage, making them dangerous opponents. A large number of them appear scattered throughout the area and their pale skin blends in with their surroundings, making them difficult to spot and increasing the likelihood of ambush by several at once. Some Bloodlickers patrol, while others sit in fixed locations; those on patrol can spot you from a considerable distance. They're highly defensive and will constantly back away from you in order to keep you in front of them. They use fast horizontal arm swipes, far-reaching jump attacks and a multi-hit tongue combo, and can strike directly behind them with a backward kick, making it dangerous to stand in this position for too long. If you attempt to use an item while in range, they will immediately punish you with their jump attack; however, they have little ability to hit you if you stand at least 90 degrees to their left, and you can reliably avoid their attacks by staying in this position using strafes and quicksteps. Bloodlickers are weak against thrust attacks and fire damage, so using weapons boosted with Fire Paper is a good idea, especially one with a thrust attack that can track them. They cannot be interrupted or staggered, making it impossible to use visceral attacks, but ordinary melee swings and transformation attacks work well. 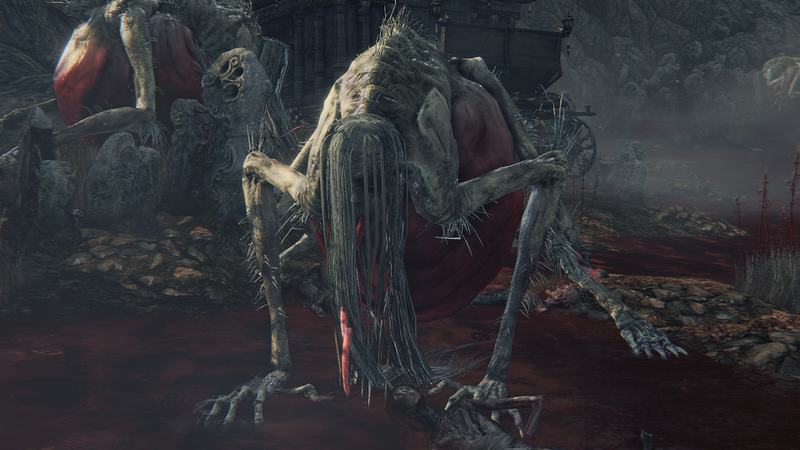 These fully-engorged Bloodlickers are encountered in large numbers along the river of blood in the Hunter's Nightmare. 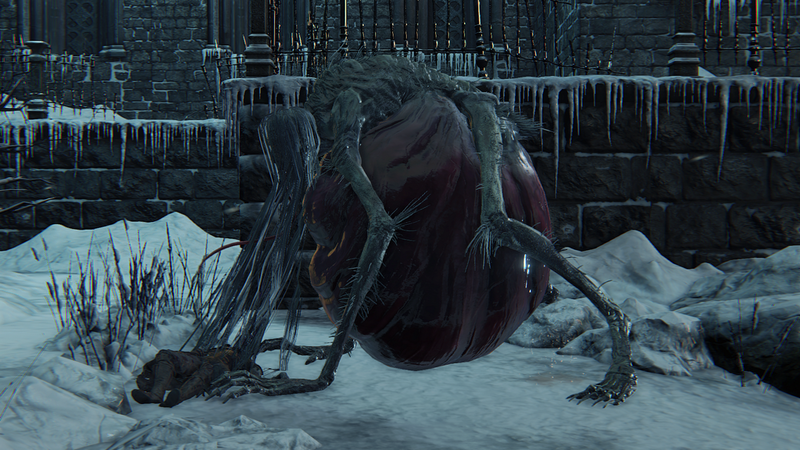 Though they use the same tongue whips and arm combos as those found in Cainhurst and the Chalice Dungeons, this variant does not share the same leap attacks; instead, they focus on projectiles and group ambushes. At long range they will spit streams of blood which have strong tracking and cause slow poison buildup, and will begin using a delayed body slam when engaged up close. All members of a given group will attack together if one is provoked, and all will simultaneously disengage and return to their starting positions if you retreat far enough for even one to lose interest. With the dense distribution of other enemy types throughout many of the same enclosed areas as these, it is almost impossible to avoid fighting several foes at a time. Keep a close eye on your surroundings while crossing the Castle Grounds to ensure that none of the Bloodlickers in the area are able to sneak up on you. Avoid fighting several at once, as doing so will leave you virtually no opportunities to attack. Instead, lure them one at a time with thrown weapons or simply allow one to see you and retreat to a safe spot to fight Stand directly to their left when at close range and strike with quick single R1 attacks, while strafing or quickstepping counterclockwise to maintain your position; avoid using combos in this situation. 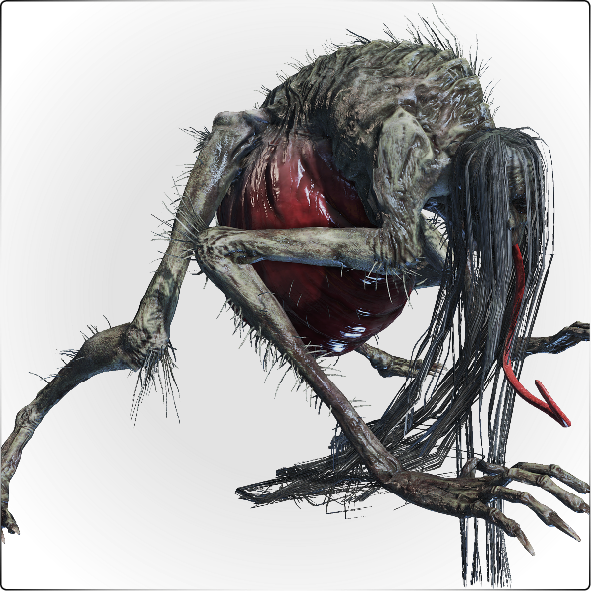 Bloodlickers will hiss immediately before using their frontal attacks, so be prepared to quickstep behind them as soon as you hear this cue, Molotovs are viable if you haven't yet been spotted, but will usually miss if you have. Try to use the fountain and the statues dotting the area to obstruct the Bloodlickers' movement and get them stuck, preventing them from hitting you with their jump attacks while you use Blood Vials. Cannon shots augmented with Bone Marrow Ash are an effective and economical way of dealing heavy damage to entire groups of these enemies with a single blow. Hunter tools such as A Call Beyond and the Tiny Tonitrus are effective for this purpose as well, as are Molotov Cocktails and charged attacks with wide arcs such as that of the transformed Hunter Axe. When fighting more than one at a time, try to use the uneven terrain to obstruct their blood spit attack and separate them as much as possible. When they lose interest and disengage, they can be struck with jump attacks or projectiles on the way back to their starting locations before they can turn around to resume the offensive. In general, quickstep forward through their attacks and perform (R1) combos while positioned at their sides; avoid standing behind them as they will respond with a swift backward kick. Charged attacks from heavy weapons such as the transformed Kirkhammer will knock them down or send them flying, though keep in mind that they cannot be interrupted or staggered. 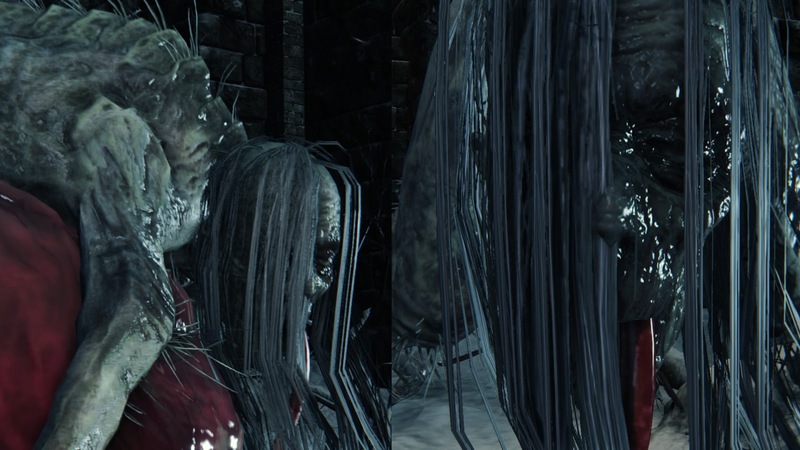 Starved variant in Cainhurst. Mid fed variant in Cainhurst. 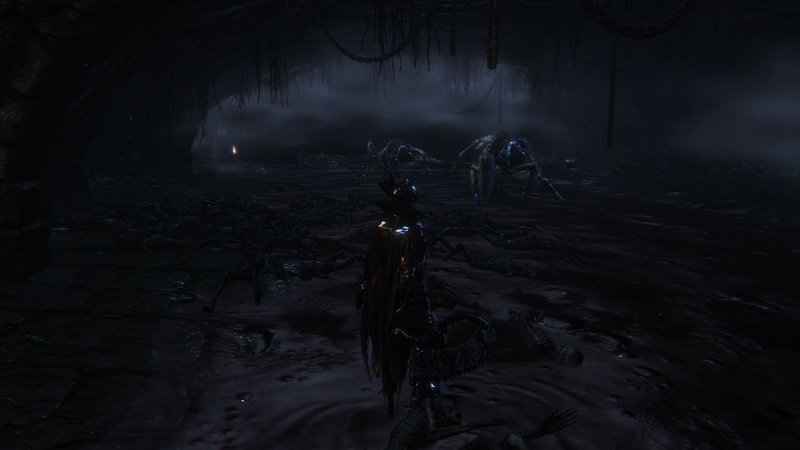 Fully fed variant in Cainhurst. Almost fully fed variant in Hunter's Nightmare. 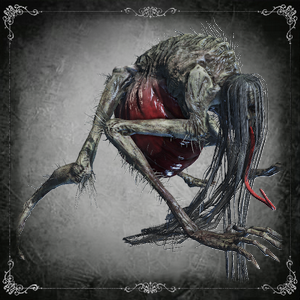 Pungent Blood Cocktails don't attract this enemy, making the item ineffective. Shaman Bone Blades affect this enemy, making it hostile to other enemies. 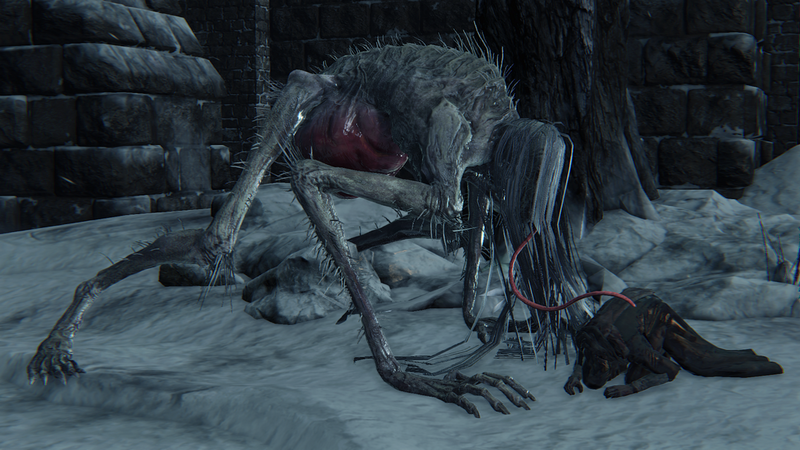 Root Chalice Dungeons: The Bloodlickers from Forsaken Cainhurst Castle also turn up in dungeons, and their appetite for blood is just as strong here. 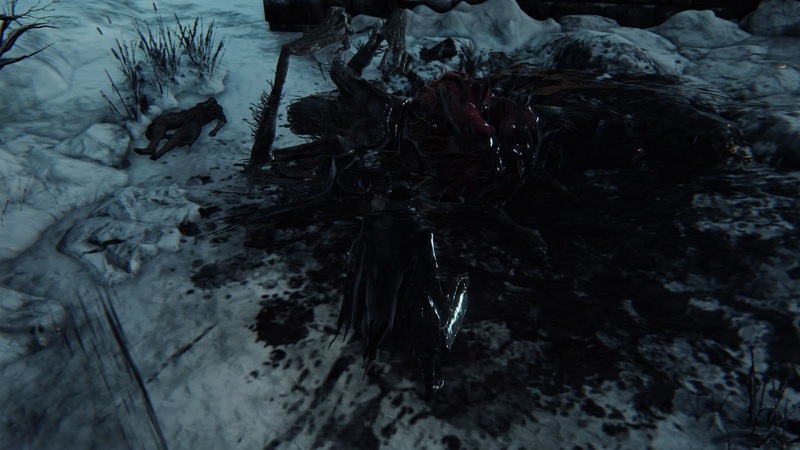 After killing any strong enemy, and then heading off to other parts of the layer, there's a chance that when you return to the room you killed it in a Bloodlicker will appear to feed on the corpse. There's no indication that this has happened, so you won't know until you come face-to-face with one after reentering a room. In some of the higher depth dungeons these enemies can be very deadly, so you'll need to consider carefully whether to take one on or simply run past it. Jumping Slam No Swift forward jump attack with variable range; quickstep sideways or forward. Tongue Combo No Multiple rapid hits with very little forward momentum; quickstep forward or backward. Blood Spit No Quickstep sideways each time they launch a stream of blood or use the environment for cover. Body Slam No Quickstep forward past them. Be careful to account for the short delay. Rear Kick No Quickstep sideways or avoid standing directly behind them. Tongue Combo No Quickstep forward past them. Arm Combo No Quickstep forward past them once to twice and continue strafing to stay behind them. For enemies that also appear (or exclusively appear) in dungeons, their stats will be shown at the base level, because their exact stats at any given point are calculated from these base values. The basic formula is: Total Value = Base x A x B x C x D. Multipliers written down below were datamined directly from the game files. 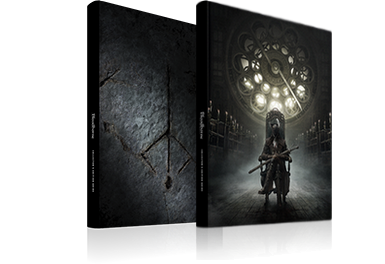 Multiplier A represents depth (1 - 5) of the chalice dungeon; multiplier B is layer (1 - 4) of the specific chalice dungeon; multiplier C is used when dungeon is Pthumeru Ihyll; multiplier D is for calculating blood echoes when additional curse rite is used.